Want to know where you're most likely to have your ship hijacked by pirates this year? Now you can, with the help of the International Maritime Bureau's "live piracy map," a Google map mashup that gives you quick, real-time details on all the acts of piracy taking place on the Earth's high seas. Just drill down by using the zoom slider, and click on a flag to see what kind of crime took place. All are labeled with the type of ship, as well as whether the pirates successfully hijacked it or merely boarded. Certain areas, like this one off the coast of East Africa, are pirate paradises. The seas around Singapore and Malaysia are also packed with pirates. Clearly the future bodes well for sea-going pirates, and for pirate-lovers who want to track their dastardly deeds. 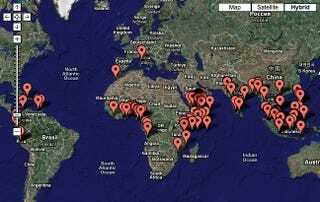 Live Piracy Map [via BLDG BLOG] Images via Live Piracy Map.